When Raninder Singh, president National Rifle Association of India unveiled the junior programme plans post the debacle in Rio Olympics 2016, he faced severe criticism from within the shooting fraternity. There were skeptics. There were critics. He also faced stiff opposition from senior shooters. Two years later, as Indian shooters reap a big medal haul from Asian Games and the ongoing ISSF World Championships, Singh cannot stop beaming. Those who disbelieved him then, now acknowledge that his plan has worked. 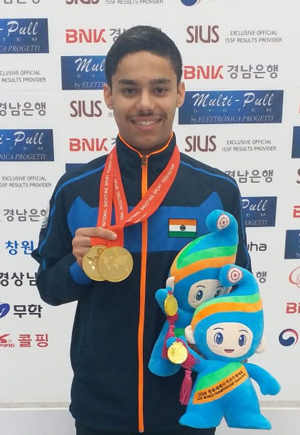 In its most successful campaign at the 52nd ISSF World Championships in Changwon, Korea, India, with a tally of 11 gold, nine silver and seven bronze medals, is thus far placed third behind powerhouse China and hosts Korea in the medals tally. India also bagged two Tokyo 2020 Olympic quotas from Changwon, through Anjum Moudgil and Apurvi Chandela in the women’s 10m air rifle event. This comes on the heels of Indian shooters’ stupendous performance in the Asian Games in Jakarta, where they won 10 medals (two gold, four silver and three bronze medals). Speaking to THE WEEK from Chanwon, Singh could barely hold back his joy at the team’s performance in the quadrennial event. He gave credit to the Abhinav Bindra-led review committee’s recommendations post the Rio debacle which the NRAI accepted in toto. “I feel exalted by the results. You’ve got to realise where we are coming from,” Singh said. “In Grenada (World Championship) four years ago, we came back with just one silver medal―won by Jitu Rai. Here we are looking to finish with 26! Apart from the fact that we have already bagged two quotas in air rifle , more than 90 per cent of our medals have been won by our juniors. So, it is vindication of our vision with regards to our junior programme, and that we were allowed to run it the way we had planned… Thanks also to the support and belief shown by SAI in our programme. Buoyed by the success of the juniors in international events, the NRAI president also stated that the federation would stick with its junior coaches despite there being a move by SAI to not renew all junior coaches’ contracts. “I am not going to change junior coaches. If SAI is not funding the coaches, then NRAI will give them contracts. Key to our current success are our coaches. We have brought our own Indian coaches into the system. The junior coaches will be part of the national camps if the juniors they coach are part of the senior team,” Singh said. While the programme is being appreciated, it's still a work in progress. There are still many aspects of it that require fine-tuning and tweaks. One aspect is of multiplicity of coaches that can create confusion in a young shooter’s mind. There is also the issue of better communication between junior and national coaches vis-a-vis young, upcoming talent. “It's a strategic decision. A child's mind is best handled by the junior coach if he is there. If a junior is part of senior team, he will train with the senior squad. Junior coaches training those wards will be inducted in senior camp,” Singh further clarified. The decision comes after Athletes’ Commission of NRAI and some coaches including junior coach Jaspal Rana pointing out that he was unable to work with some of his pistol shooting wards due to different camps in Bhopal and Delhi. NRAI president also backed the decision that individual coaches of shooters will not be allowed in national camps. India’s foreign coach had shot a letter to all shooters during the last national camp barring them for bringing personal coaches while training. This had upset many individual coaches like Olympian Joydeep Karmakar whose protégé rifle shooter Mehuli Ghosh was part of the senior national team which trained in New Delhi ahead of the World Championships. “He did the right thing. For Asian Games and World Championships, we did not allow private coaches to be around. Our Athletes Commission looked at the issue and took a decision that too many coaches were causing confusion. They recommended individual coaches not to be allowed in national camps. It's fair. You cannot have seven coaches for four kids. It creates confusion,” Singh said. Meanwhile, Sodhi gave a word of caution regarding youngsters. “What will be the test for these young shooters is when people start expecting you to win. Jitu Rai is an example. Manu Bhaker, Anish Bhanwala are examples. We need to be careful with them,” he said while reiterating that experience also is needed. 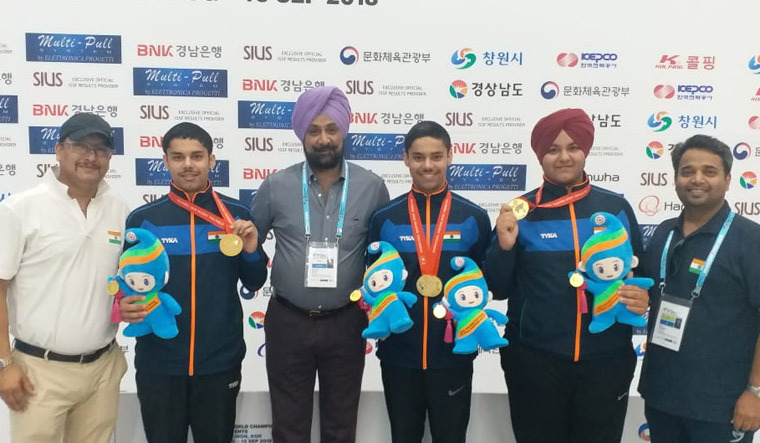 Singh was bullish regarding India’s shooting performances in the future especially going into the Tokyo 2020 Olympics. “We are Looking for a handful of quotas in Asian Championships next year with China and Korea already bagging a lot of quotas here. Do not be surprised if you see some of these juniors in Tokyo. They are very close,” he said.